The Old Firm derby rarely disappoints in terms of drama, but this clash between Rangers and champions Celtic had plenty of quality too. The hosts took an early lead, Josh Windass robbing the hapless Dedryck Boyata before firing home in the third minute. An exquisite strike from Tom Rogic brought Brendan Rodgers’ men level just eight minutes later, but with the Celtic defence struggling to settle Daniel Candeias fired Rangers ahead once more. Moussa Dembele’s strength and poise from Scott Brown’s speculative pass earned Celtic a second equaliser on the stroke of half-time, before the scorer turned creator for substitute Odsonne Edouard to get the winner on 69 minutes. It was a huge win for title-chasing Celtic, who saw the game out with 10 men after Jozo Simunovic saw red for an elbow before the hour. 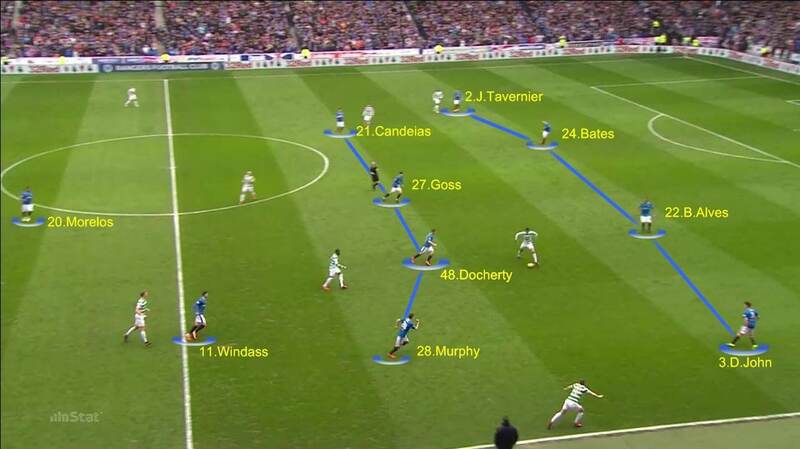 Graeme Murty lined Rangers up in a 4-4-1-1 formation, with Josh Windass playing off Alfredo Morelos in attack but often dropping back into a 4-5-1 in defence. The front pair worked hard to press the Celtic defence in possession, in a bid to force them to play long towards their strong centre-backs or out wide so the wingers, Daniel Candeias and Jamie Murphy, could join the press. This approach was key to the home side’s chances, as they wanted to stop Brendan Rodgers’ team from playing the ball through midfield and imposing themselves in attack. Pressing the ball too hard in midfield did leave space in behind the line, however, and they struggled to stop Celtic’s two central midfielders, Scott Brown and Olivier Ntcham, from controlling the ball. The defensive line also had issues in their final third, where there was often a lack of understanding between the presser and rest of the defence. At times, they dropped too deep towards Wes Foderingham’s goal; at others, they lacked defensive depth and left too much space in behind – the latter was particularly evident for Celtic’s second goal. In attack, Rangers were more effective. 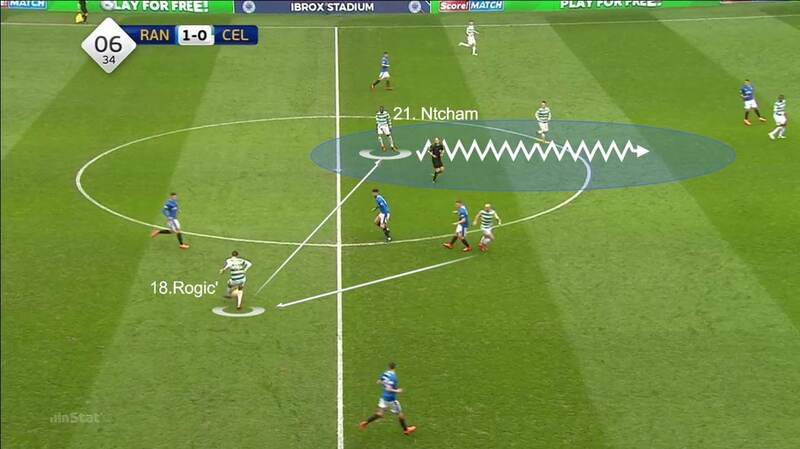 They mostly looked to bypass the Celtic midfield and play direct towards Morelos, and then get supporting runners playing off him wide – where both full-backs constantly looked to combine with their wingers – or winning second balls in midfield. The pace and directness of their approach caused Celtic problems, and either directly or indirectly led to both goals on the day. 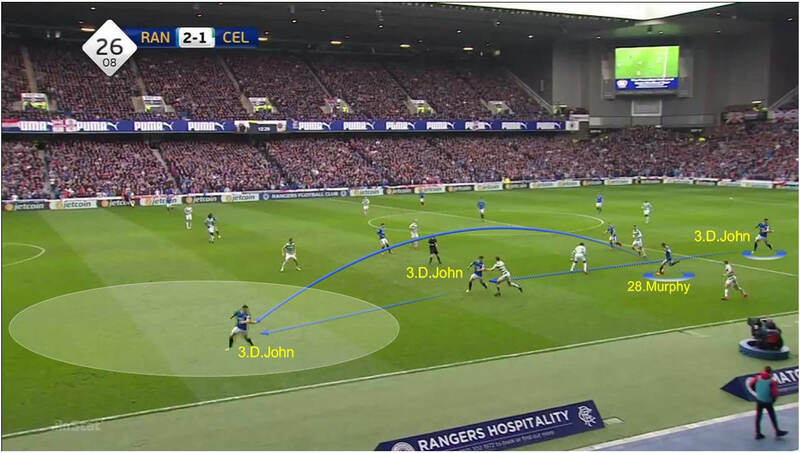 The persistence of Josh Windass in pressing Dedryck Boyata from an early long ball led to the opening goal, while it was left-back Declan John getting beyond his winger Jamie Murphy and playing in a fast cross that led to Candeias’ second. On the counter-attack, Rangers again looked direct to Morelos and tried to isolate Boyata and take the Celtic defence by surprise. 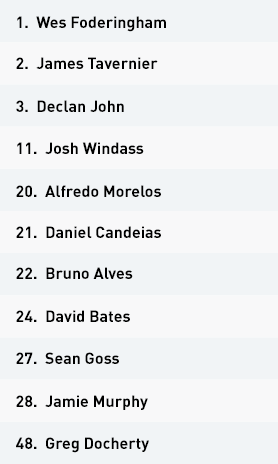 Windass was the main support runner in these situations, which did cause the visitors some issues. 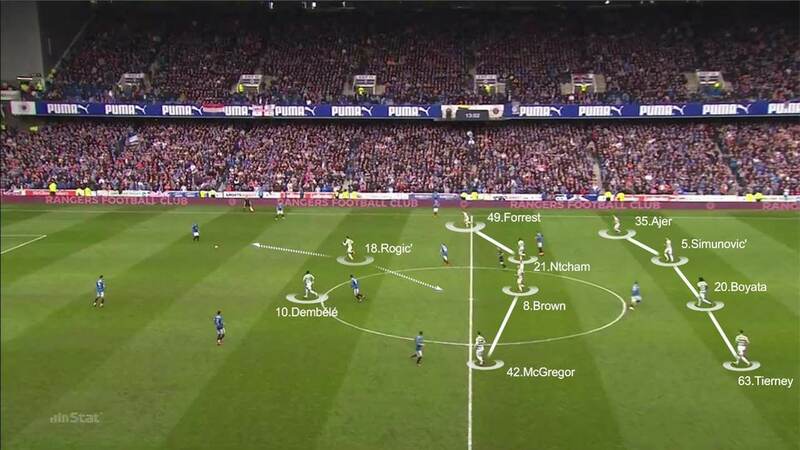 Rangers set up with a 4-4-1-1 formation. 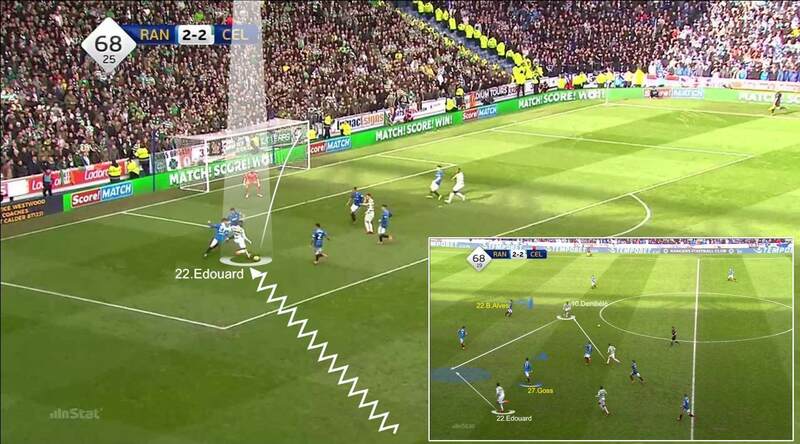 Out of possession, Alfredo Morelos positioned himself between the Celtic centre-backs, with Josh Windass in behind him and then two solid defensive lines of four. 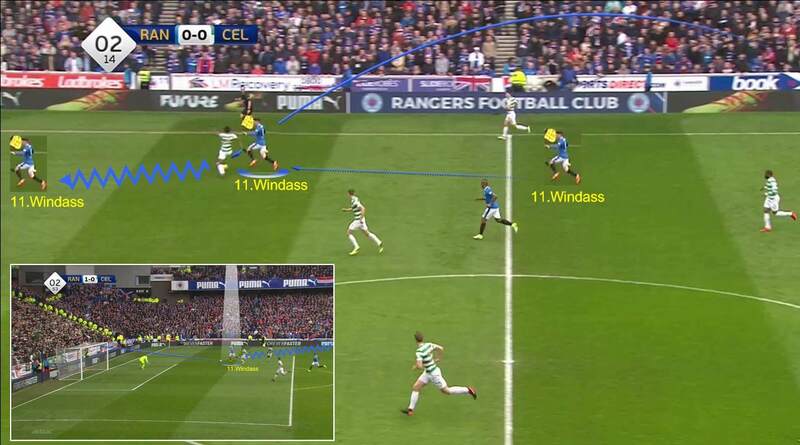 However, as we see here, Celtic were able to exploit the space in between those lines. At corners, Rangers combined their defensive approach. 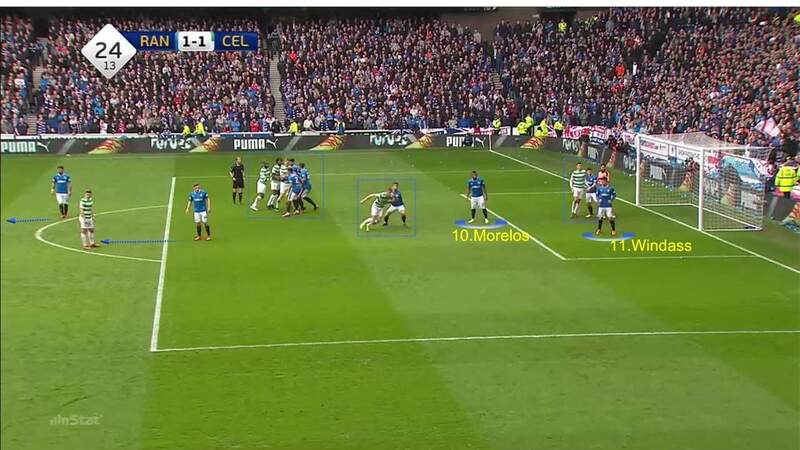 Morelos and Windass are marking zonally, two players outside the box are tasked with clearing any rebounds and launching the counter-attack, while the rest man-marked. This generally worked well. Rangers took an early lead thanks to weakness in the Celtic defence. Windass presses and robs Dedryck Boyata, before bearing down on Scott Bain and beating the Celtic keeper with a powerful strike. Rangers were able to get in behind the Celtic defence in wide areas, where their full-backs and wingers looked to combine. Here, Jamie Murphy and Declan John combine down the left, from where the latter’s cross led to the home side’s second from Daniel Candeias. The Rangers defence tried to push high up the pitch, but that created large spaces in behind that Celtic were able to exploit. Here, a long ball into space from Scott Brown is picked up by Moussa Dembele, who evades the home defence to level the match at 2-2. Celtic set up in a 4-4-1-1 formation, with Tom Rogic playing off Moussa Dembele up front. 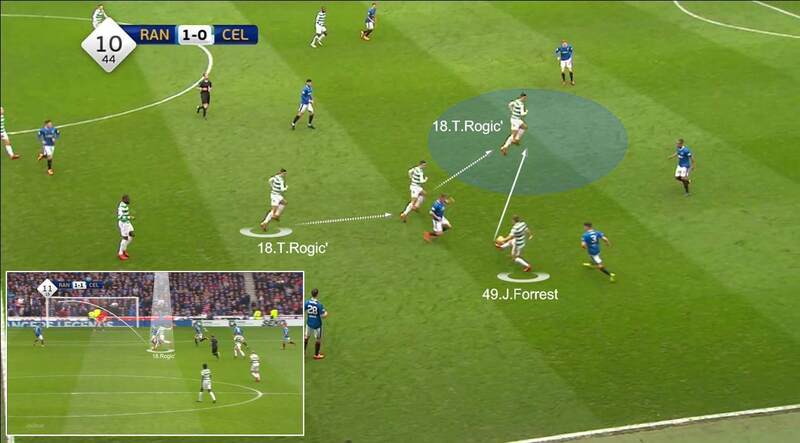 Out of possession, Rogic worked hard to take up positions that would make his team would be as compact as possible. In possession, the attacking midfielder looked to move between the lines and bring continuity to the visitors’ game. Here, he drops deep to pick up possession from Scott Brown before finding Olivier Ntcham in space. 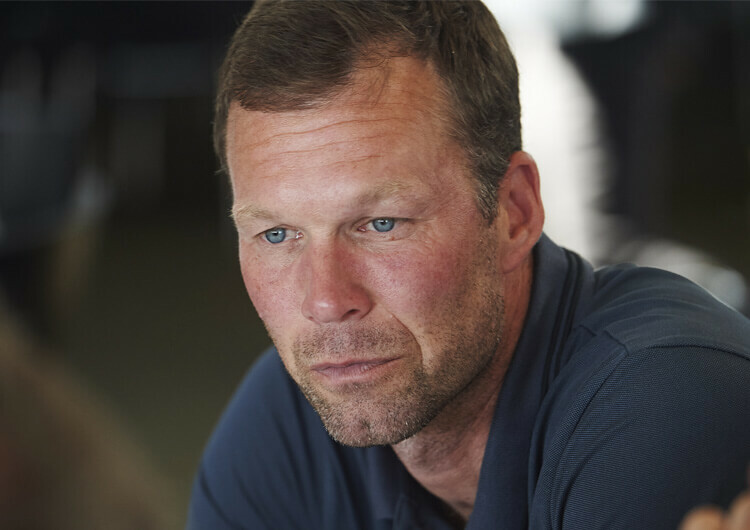 Brown was tasked with covering and balancing the last defensive line when the visitors pressed forward. Here, the Celtic captain is quick to cover the space left by Boyata pushing up, ensuring that Jozo Simunovic is not isolated. Rogic was often the key man for Celtic in beating the Rangers press. Having gone a goal down early, the visitors hit back quickly thanks to the Australian’s intelligent movement and superb long-range strike. It was substitute Odsonne Edouard, who came on for James Forrest midway through the second half, who won the game for Celtic. He took advantage of poor positioning by the covering Sean Goss to collect a clever ball from Dembele and surprise Wes Foderingham with an early shot. 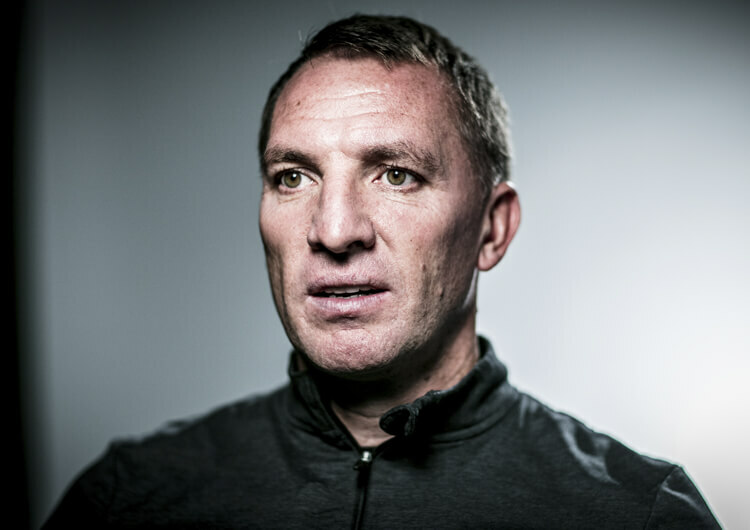 Brendan Rodgers set Celtic up in a 4-4-1-1 formation, with Tom Rogic operating behind Moussa Dembele and the two wingers, Callum McGregor and James Forrest, pushing forward into a 4-2-3-1 in attack. Following Jozo Simunovic’s sending-off just before the hour, they moved to a straightforward 4-4-1. Out of possession, the midfield line worked hard to support their front two and always be compact in the Rangers half. 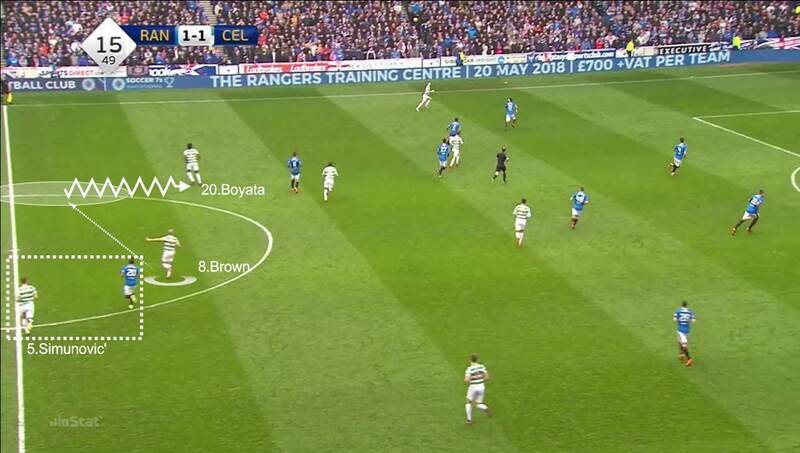 Their pressing was intelligent, with captain Scott Brown always taking responsibility for covering any gaps – either in midfield or in the defensive line if either of his centre-backs, particularly Dedryck Boyata, moved out of position. The Celtic midfield were not afraid to commit tactical fouls if they sensed the slightest chance of being beaten and exposing their defence to any danger. They did struggle down their flanks, however. 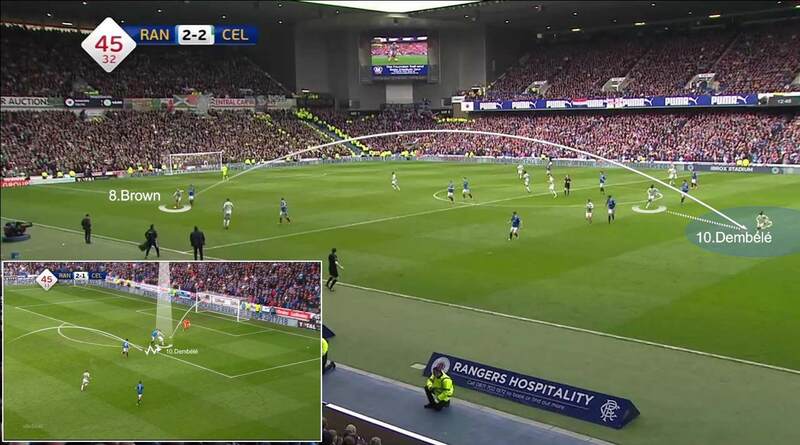 On the left, Boyata and Kieran Tierney had problems controlling Rangers’ runs – it was from this channel that Josh Windass broke away to score the opener. And it was down their right from which the second Rangers goal originated, as they failed to properly deal with the overlapping full-back. 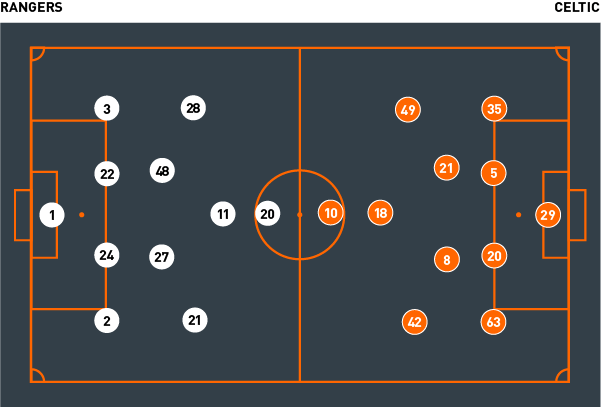 In attack, they alternated between a direct game into the front two, who would look to run off each other, or short passes to attract Rangers’ defensive lines into their half. Boyata and Simunovic looked quickly for Brown or Olivier Ntcham in midfield, who would then look to get the ball in between the lines to find the intelligent Rogic – it was from such a move that the Australian scored Celtic’s first equaliser. When Rangers tried to tighten up their defensive lines to cover these spaces, Celtic could then look for the runs of Dembele to cause confusion in behind them. This is exactly how they got their second equaliser on half-time, as the pacy forward broke in behind to latch on to Brown’s clever long pass to score. 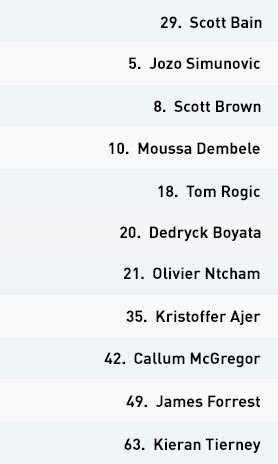 After Odsonne Edouard’s introduction for Forrest in the second half, they looked to exploit the gaps in between the centre-backs and full-backs, despite being down to 10 men. The tactic was successful, with the substitute scoring the winner from Dembele’s pass with 20 minutes to go. Their offensive transition was direct throughout, as they tried to get into the attacking half and exploit any defensive gaps between the Rangers lines. 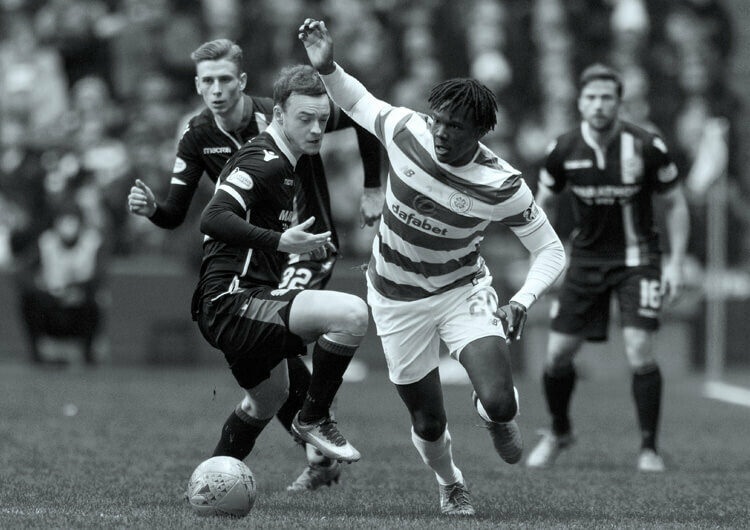 There was an uncertain defensive display from Dedryck Boyata. The Celtic centre-back was at fault for Rangers’ first goal and was unconvincing in trying to deal with the cross that led to their second. Rangers struggled to seal off the space in defensive areas, leaving too much room between the lines but also behind their final line too. This created open spaces from which the visitors were able to carry a real threat. Tom Rogic was excellent. Out of possession he inhabited good areas to prevent Rangers from advancing easily, while in attack he took up clever positions between the lines. This led directly to Celtic’s first goal, which he scored himself – and indirectly to their second, as Moussa Dembele ran into the space left by a defence trying to push up and close up the areas between the lines. Having gone down to 10 men in the second half, Brendan Rodgers’ team displayed an impressive defensive rigour. They created a solid, impenetrable block of two lines in their own half while still carrying the attacking threat that helped them win the game.